Clth, 9.5 x 12 in. / 183 pgs / 98 color. Text by Matthew Collings, Mel Gooding, Robert Hobbs, Donald Kuspit, Robert S. Mattison, Saul Ostrow, John Yau. Robert Motherwell, who died in 1991, was the youngest member of the first wave of Abstract Expressionists known as the New York School (a phrase he coined), which also included Jackson Pollock, Mark Rothko, Willem de Kooning and Barnett Newman. 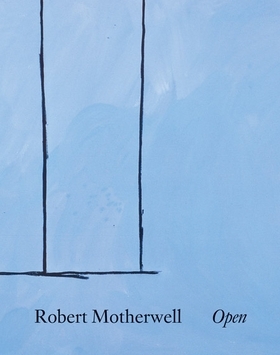 An articulate writer, Motherwell was pegged early on as the intellectual of the group. Robert Motherwell: Open is the first examination of the painter's Open series, which preoccupied him from 1967 until the last years of his life. Pared down and minimal, these paintings differ greatly from his more dynamic and monumental Elegies series, for which he is perhaps best known. Containing many previously unpublished paintings as well as works in public collections, this monograph--the most comprehensive and best-illustrated book on Motherwell currently in print--introduces a series of texts by critics and art historians John Yau, Robert Hobbs, Matthew Collings, Donald Kuspit, Robert Mattison, Mel Gooding and Saul Ostrow. FORMAT: Clth, 9.5 x 12 in. / 183 pgs / 98 color. Published by 21 Publishing Ltd.